Enroute to Johnston Island, SCULPIN, under Cdr. Fred Connaway, left Pearl Harbor on 5 November 1943. After topoff with fuel, she left Johnston on 7 November to conduct her ninth patrol in an area in the Caroline Islands. Her mission was to support the action of our surface forces in the Gilbert Islands by intercepting and attacking any enemy forces which might be proceeding from Truk and the Marshall Islands to oppose our surface forces. She was to leave her area on 14 December, and return to Pearl Harbor, stopping at Johnston for fuel if necessary. SCULPIN was not heard from following her departure from Johnston Island on 7 November. During the patrol, Commander John P. Cromwell (promoted to Captain during the patrol) was aboard SCULPIN. He was to take charge of a coordinated attack group consisting of SCULPIN, SEARAVEN, and either APOGON or SPEARFISH, if formation of the group were directed by despatch. Should the group be ordered formed, Captain Cromwell would transmit his orders to them by low frequency radio from SCULPIN. On the night of 29 November, the vessels were directed to form and APOGON was named as the third member of the group. When no rendezvous orders were given by Captain Cromwell after 40 hours, new orders were sent by ComSubPac. SCULPIN was to proceed immediately to Eniwetok, make a close observation, and report any enemy shipping. This was done in order to avoid confusion among the other submarines, and to determine whether SCULPIN was all right. Although the new orders to SCULPIN were sent repeatedly on 1 December and other orders a few days later, no answer came from her. On 30 December SCULPIN was reported as presumed lost. Meanwhile, long before tension mounted at the bases concerning her, SCULPIN was meeting her test. The story presented here is reconstructed from statements made by members of her crew recovered from enemy prison camps since the close of the war. On the night of 18 November, SCULPIN made a radar contact on a fast convoy, and made an end around at full power. Submerging on the enemy track for a dawn attack, SCULPIN began what promised to be a successful approach. However, she was detected in the attack phase, and the convoy zigged toward, forcing her deep. There was no depth charge attack at this time. About an hour later, the ship surfaced to begin another end around, but immediately dived again, having surfaced 6,000 yards from a destroyer, which was lagging the convoy. Depth charging started as soon as she dived again. Early in the ensuing attack a string of depth charges did the ship minor damage. Lt. G. E. Brown, the only officer survivor, was relieved as diving officer to make an inspection and found her fundamentally sound. At this time the submarine had succeed in shaking the enemy, but before Brown returned to the control room the ship had broached when the diving officer had tried to bring her to periscope depth and the depth gauge had stuck at 125 feet. The depth charge attack was renewed at once. About noon on 19 November, a close string of 18 depth charges threw SCULPIN, already at deep depth, badly out of control. The pressure hull was distorted, she was leaking, steering and diving plane gear were damaged and she was badly out of trim. Commander Connaway decided to surface and to fight clear. The ship was surfaced and went to gun action. During the battle Commander Connaway and the Gunnery Officer were on the bridge, and the Executive Officer was in the conning tower. When the destroyer placed a shell through the main induction, and one or more through the conning tower, these officers and several men were killed. Lt. Brown succeeded to command. He decided to scuttle the ship and gave the order, "all hands abandon ship." After giving the order the last time the ship was dived at emergency speed by opening all vents. About 12 men rode the ship down, including Captain Cromwell and one other officer, both of whom refused to leave it. Captain Cromwell, being familiar with plans for our operations in the Gilberts and other areas, stayed with the ship to insure that the enemy could not gain any of the information he possessed. For this action, ComSubPac recommended that he be given the Congressional Medal of Honor. In all, 42 men were taken prisoner by the Japanese destroyer, but one was thrown over the side almost immediately because he was severely wounded. Another man escaped being thrown overboard only by wrenching free of his captors and joining the other men. The group of 38 enlisted men and 3 officers were taken to Truk where they were questioned for ten days. Then they were loaded on two carriers (21 on one, 20 on the other) and started for Japan. Enroute to its destination, the carrier CHUYO, carrying 21 SCULPIN survivors, was torpedoed and sunk by SAILFISH on 31 December 1943, and only one American escaped. This was a particularly coincidental and tragic event since SCULPIN stood by SQUALUS (later recommissioned SAILFISH) when she sank off Portsmouth, New Hampshire in 1939. At Ofuna, the 21 survivors were repeatedly questioned, and they learned they were in an unofficial Navy prison camp. They were released from the camp a few at a time when the enemy became convinced that they could get no information from them, and were sent to work in the copper mines of Ashio. There they were allowed to register as prisoners of war, and received at least enough food to live on, although not enough to maintain health properly. They remained at Ashio until released by American forces on 4 September 1945. 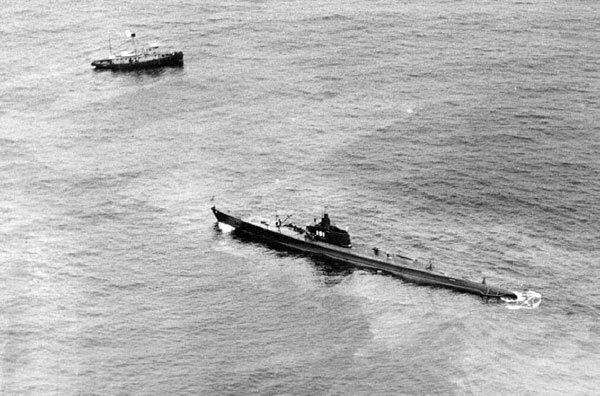 This submarine on her first eight patrols sank nine ships for 42,200 tons and damaged ten, totaling 63,000 tons. Her first patrol off the east coast of the Philippines group resulted in one sinking, the 3,124 ton transport KANKYO MARU on 10 January 1942. During her second patrol in the region east of Celebes, she sank a destroyer type vessel and did damage to a light cruiser. Her third patrol was conducted in the Molucca Sea, and SCULPIN damaged a freighter. On her fourth patrol, conducted in the South China Sea, she is credited with having sunk a freighter, damaged a freighter and damaged three tankers. 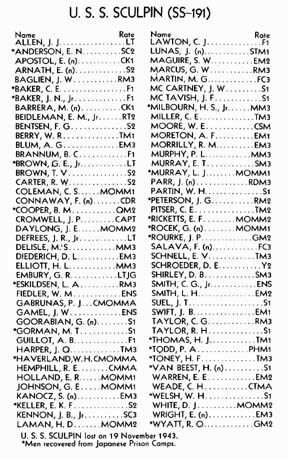 See also Ed Howard's Final Patrol page on USS Sculpin (external link).